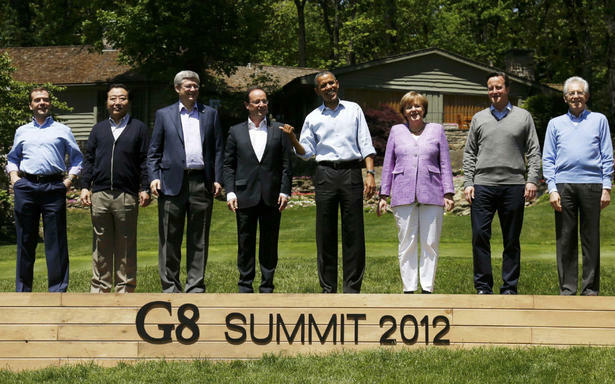 French President François Hollande made his debut on the international stage at the G8 and NATO summits in the US over the weekend. Perhaps a sign of the rocky ride ahead of him, he managed to upset at least three of his fellow leaders. Within this package of proposals there will be Eurobonds, and I will not be alone in proposing them. I had confirmation on this at the G8. I believe that prescription [i.e. Eurobonds] comes at the wrong time and carries the wrong side-effects. Hollande has also expressed strong reservations about German Finance Minister Wolfgang Schaeuble taking over the chairmanship of the Eurogroup. Hollande is reportedly insisting that Schaeuble should resign from his post before taking on the new role (which doesn't make much sense, as the Eurogroup is supposed to be a forum for the finance ministers of eurozone countries). It would most probably be desirable to have a recapitalisation, and it would most probably be necessary that this recapitalisation takes place through mechanisms of European solidarity. If he said that, it must be because Mr Hollande has information that we don't have. Therefore, I don’t think Mr Hollande said that because, logically, he doesn’t know how the Spanish banks are. The two will have time to settle the issue when they meet in Paris tomorrow. On the financial transactions tax, I'm very clear, we are not going to get growth in Europe or Britain by introducing a new tax that would actually hit people as well as financial institutions. I don't think it is a sensible measure. I will not support it. Tactics is the wrong word: it presumes forethought. These are just stupidities, as we expecct from the European political class. And Cameron's embracing of Eurobonds only show how he misunderstands the meaning of bonds: if his word is his bond, it's worthless. A eurobond would invite a coupon suitable for the weakest guarantor.